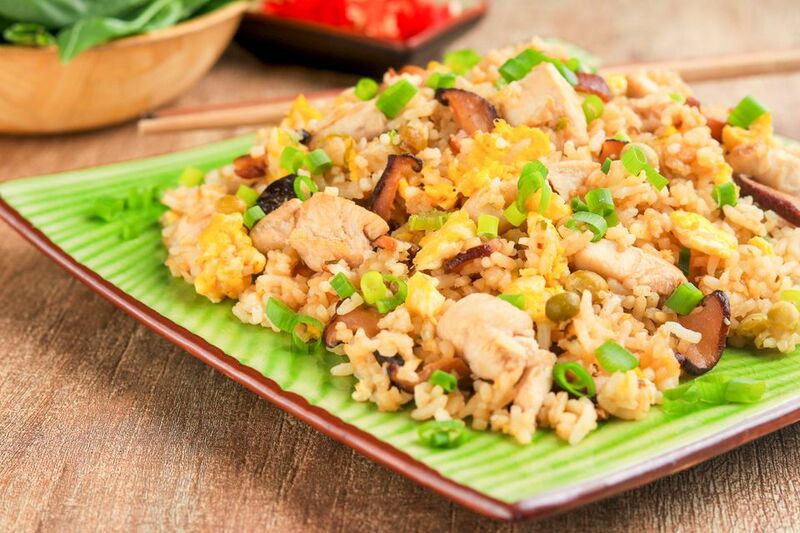 This simple, yet tasty recipe for chicken fried rice will please everyone at your table with its vibrant flavors. It is easy to make at home, and rivals the fried rice you would get at your favorite Asian restaurant. If you happen to have leftover rice, making this fried rice recipe is the perfect way to use it up; but even freshly-made rice works well when fried up in the right way and with the right sauces. This recipe will teach you how to do just that, so your fried rice tastes as light and flavorful as it possibly can. The dish also includes vegetables (mushrooms and peas) and is topped off with spring onion, giving it a fresh and bright appearance. Some traditionalist Thai food fans claim that fried rice including soy sauce is not authentically Thai but more like a Chinese stir-fry, while other Thai cooks—including cookbook authors—include the ingredient without apology. Whether to use or not is up to you. Serve with Thai chili sauce on the side for those who like it extra spicy. If using leftover cold rice, drizzle a teaspoon or two of oil on your fingers and work through the rice, separating clumps back into grains. Place chopped chicken in a bowl and add soy sauce. Stir well and set aside. Combine all the stir-fry sauce ingredients together in a cup. Set aside. Heat a wok or large frying pan over high or medium-high heat. Drizzle in 2 tablespoons of oil and swirl around, then add the white parts of the spring onion plus the garlic and chili. Stir-fry 1 minute, then add the chicken. Stir-fry 2 to 3 minutes, or until chicken turns evenly opaque. Add mushrooms and celery and stir-fry 2 to 3 minutes, until everything is cooked through (celery should stay a little crunchy). If your wok or pan becomes too dry, add a little more oil or 1 to 2 tablespoons chicken stock. Keeping the heat high, add the rice. Stir-fry using a spatula or other flat utensil to gently lift and turn the rice. Gradually begin adding the stir-fry sauce, 1 to 2 tablespoons at a time. Continue stir-frying 6 to 10 minutes, or until all the sauce has been added. Add frozen peas and stir to incorporate. Then push everything aside to reveal the center of the pan. Crack in the egg and quickly stir-fry to scramble. Continue stir-frying everything together over high heat 2 more minutes or until rice is light and falls easily into separate grains. Remove from heat and taste-test, adding a little more fish sauce until the desired flavor is achieved. If too salty, add a squeeze of lime juice. Top with reserved green onion. For those who like it extra spicy, serve with Thai chili sauce on the side. Although stir-frying looks simple, there are a few tips in mind so you don't end up with a burnt or unevenly cooked dish. Non-stick pans make frying easier, as there is more moisture kept in the pan; if you don't have non-stick, the pan can get too dry, especially after frying the egg. Adding a little oil can help—just push the ingredients aside and drizzle some into the bottom of your pan, then continue stir-frying. Also, this will give your fried-rice a restaurant looking "shine" when served. Avoid adding any more stock or other liquids when frying the rice, or your rice will become too heavy and lumpy.